Buy 3 Boxes and save $30.00! 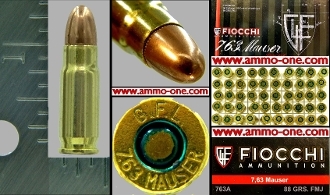 One box of 50 - .30 Mauser or 7.63x25mm Mauser, newly loaded by Fiocchi of Italy with an 88 grain FMJ (full metal jacket) projectile. Non- Corrosive! Reloadable. One Box @ $39.95 per box.